Regular visitors to this blog will know of my ol’ mate Ted Lehmann’s and his Bluegrass, Books and Brainstorms Blog to which I often make reference. The time has come again to point you in the direction of Ted’s blog. Ted has recently visited Bloomingdale in Georgia and and caught up with guitar maker – master luthier – Randy Wood who runs a repair shop, and retail store. The venue also serves as a jam location on Saturdays and the occasional concert venue on Saturday nights. 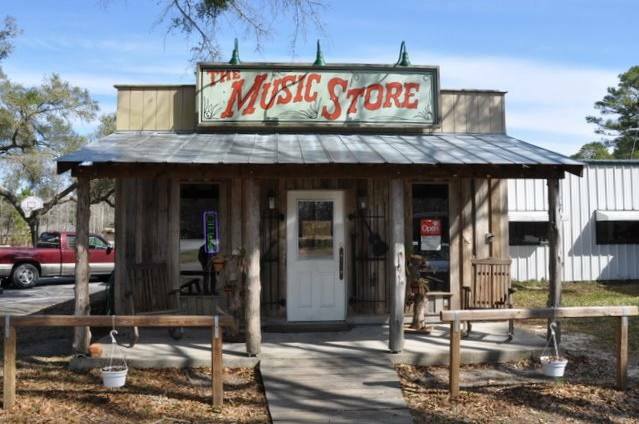 Ted’s post, on his visit to Randy Wood’s store, makes for excellent reading and contains some great history and pictures. Bill Graham is a regular columnist for the Mandolin Cafe. This month he delivers a composition on the past and future of two mandolins of vastly different vintage. 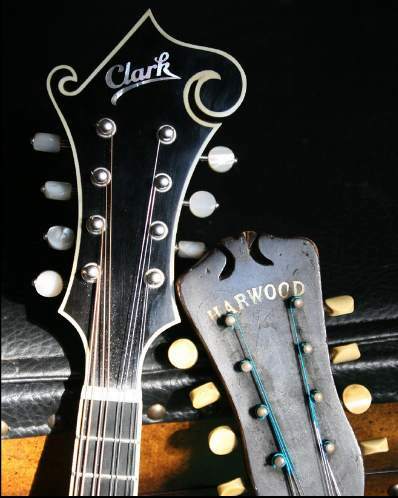 A Clark F5 Mandolin as new as they come and a Harwood recently returned to where is was originally created. Graham writes The Clark F5 shines to the eyes and the distinctive varnish smell still wafts in the air when it first comes out of its case, while the Harwood bowlback’s finish is weathered and the mandolin always smells of closet dust. Read Bill’s whole article on Mandolin Cafe. While reading the Janet Davis Website today, I discovered that Phillip Mann passed away. Phil set up bluegrassbanjo.org in 1994/95Â in an effort to more easily swap bluegrass banjo tabs with other banjo pickers. He took up the banjo some 5 years earlier and was driven by a need make it easier for banjo pickers to swap tabs. 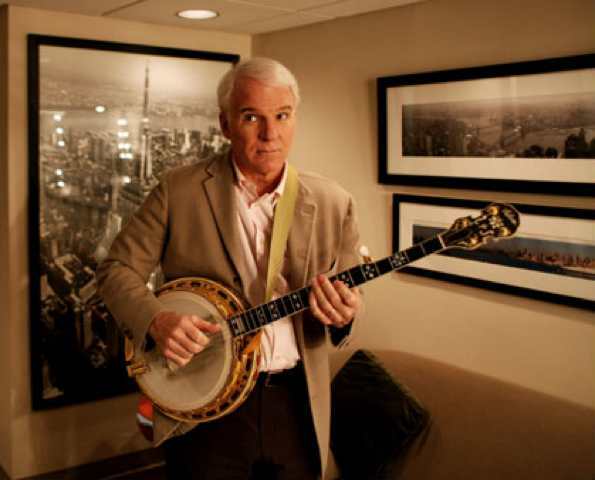 Phil’s site,Â bluegrassbanjo.org,Â was among the first Tab Sites on the Internet if not the very first. Janet Davis of janetdavismusic.com has offered to maintain Phil’s site. Phil set up the original web site for Janet Davis Music in 1996. Read the full article on Janet Davis’s Website. The Country Music Hall of Fame and Museum has advised that they have established the Precious Jewel Fund. This fund has been established to raise $1.1M to help offset the costs of acquiringÂ instruments originally belonging to Maybelle Carter, Johnny Cash and Bill Monroe. The fund raising initiative was established following approval of a $750,000 settlement with the Robert W. McLean estate in the United States Bankruptcy Court for the Middle District of Tennessee last week. The Precious Jewel Fund launches with leadership gifts including a $150,000 donation from Scott Siman of Nashville-based RPM Management and a $300,000 gift from the Academy of Country Music headquartered in Los Angeles. Earlier this month we brought you the story by Dave Wendler of Wendler Instruments of the family friend who brought in an old mandolin for him to repair, which turned out to be and original Lloyd Loar. Bill Graham writes for the Mandolin Cafe I thought this as I held a Lloyd Loar-signed Gibson F5 mandolin in my own hands for the first time and soaked up the vibe. It’s almost like a handshake with the master designer of the Gibson Master Model himself, since the sticker inside the treble F-hole bears in ink his bold signature and the date March 24, 1924. That indicates that he inspected and approved this instrument by holding it in his own hands and eying the workmanship, and probably by tuning it up and playing some tunes on it, since he was an accomplished musician as well. John Lawless, Brance Gillihan and the team from The Bluegrass Blog have produced a series of videos from the recent IBMA conference held in Nashville late last year. For those of us who were unable to attend here’s and opportunity to catch some of the action. The clips feature; Chris Pandolfi of The Infamous Stringdusters, Kelly Dueck of Kel Audio, The Alan Munde Gazette, Del McCoury, Dan Tyminski, Nicky Sanders of The Steep Canyon Rangers, Pete and Kitsy Kuykendall, Larry & Dreama Stephenson, Nancy Cardwell from IBMA, Henry, Eddie & Martha Adcock, Chris Jones & Ned Luberecki, Adam Steffey, Alecia Nugent, Terry & Cindy Baucom, Danny Paisley, Cherryholmes and Chris Eldridge and many others. Catch the entire video series on The Bluegrass Blog. MUSIC fans will soon be able to download their favourite songs from iTunes to any MP3 player, and more cheaply, with a new three-tiered pricing system. This system ends the standard fee of $1.69 in Australia and US99c in America is being introduced in the US in April. It means oldies, such as Billy Ray Cyrus’s 1992 hit Achy Breaky Heart, won’t cost as much as the new Kings of Leon single Use Somebody. Apple will charge 69c, 99c and $1.29 in the US. Apple Australia has yet to confirm that it will follow suit, but it is considered likely. Apple will remove anti-piracy software from iTunes, but the trade-off will be some higher prices and was under pressure from Sony Music, Warner Music Group and Universal Music Group to allow differential pricing. Jack Black may have been schooled in rock, but now he’d like to sing at the Grand Ole Opry with his wife’s family – who recently turned him on to bluegrass music. The actor-musician energetically sings the traditional tune Old Joe Clark with his father-in-law Charlie Haden on Haden’s Grammy-nominated CD Rambling Boy. I wasn’t sure what to expect because I haven’t recorded or really sung any old songs like that before, bluegrass style, but it came very naturally and I cranked it out in two takes,” said Black, who grew up in the Los Angeles area. There was something in the music that I think struck a chord in my DNA. I think I’ve got some hillbilly in my roots. … I’m already practising my square dancing if we play the Grand Ole Opry.